During a month-long trek through Taman Negara National Park in Malaysia, my guide explains that orangutan means ‘man of the forest’ in Malay, orang meaning man and hutan meaning forest. 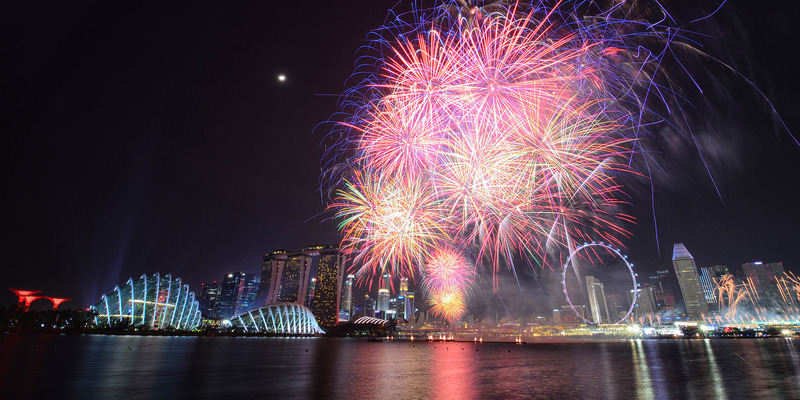 But few may know that this term didn’t originally refer to the great apes; it was once the name for the fierce tribes who lived on the islands around mainland Malaysia. Europeans muddled the names and it stuck. 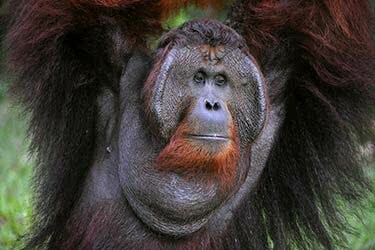 Today, even in modern Malay the four species of red ape, found only in Borneo and Sumatra, wear that moniker. 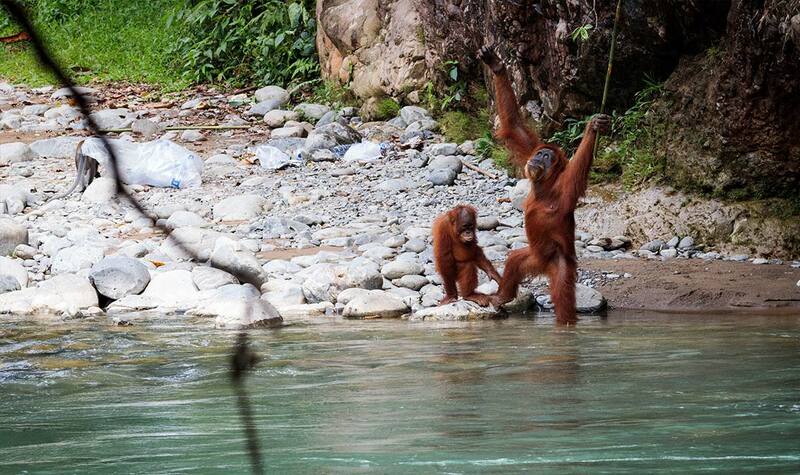 Of the few remaining places in the world where orangutans can be seen in the wild, Bukit Lawang just inside the 3,000 square kilometer Gunung Leuser National Park is the best known, for good reason. In 1973 two Swedish women established the Bohorok Orangutan Center there as the first official orangutan rehabilitation project in the world. 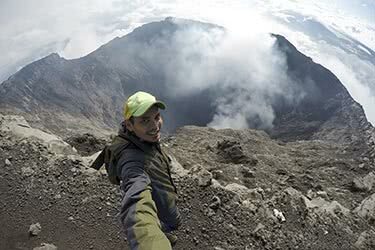 Gunung Leuser is heralded as one of the most likely places for an intrepid hiker to come across one of the red apes in the wild, and today orangutan tourism is the top draw of the park, which has since been designated “Tropical Rainforest Heritage of Sumatra” by UNESCO, along with Kerinci Seblat and Bukit Barisan Selatan national parks. Ganung Leuser is the only place in the world where elephants, tigers, and rhinos still co-exist with orangutans in the wild. 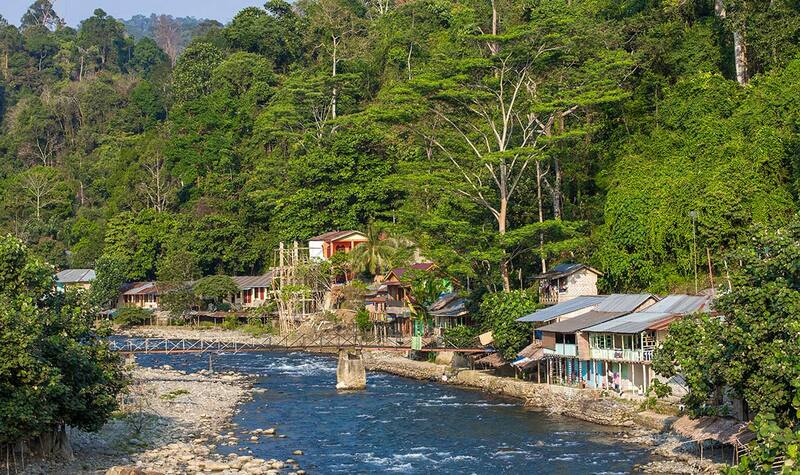 Owing to its proximity to the major city of Medan, Bukit Lawang is the more popular of the park’s two entrances. 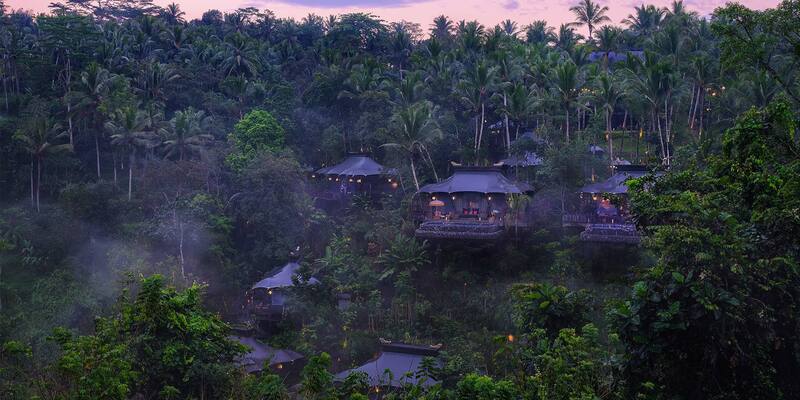 Today the once remote village has become a bustling outpost of guest houses and tour companies that specialize in bringing tourists face to face with both habituated and wild orangutans. Once the park’s Bohork River boundary is crossed, the civilized world is traded for jungle, wet and teaming with life. 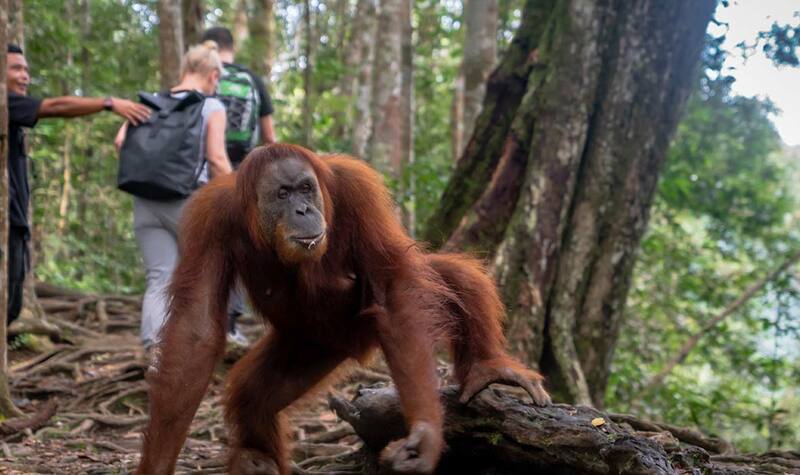 Tours from Bukit Lawang range from a simple day-hike along what is known as the orangutan loop – where several habituated females are known to spend time waiting for tourists thanks to feeding from local guides – to multi-day treks. For those with the time and a decent level of physical fitness, the longer treks delving deeper into the forest offer opportunities to get a glimpse of the great apes in their natural habitat: gathering food, mothering their young, and building their nests. Orangutans aren’t the only endangered animal in the park. Longer treks also provide the possibility of seeing wild elephants, sun bears, and even traces of the elusive Sumatran tiger. Longer journeys stop at fixed camps along the banks of the Bohorok River, where hikers can soak tired legs in the pure waters and enjoy an evening meal of authentic Indonesian cuisine prepared by camp cooks before bedding down under starry skies. 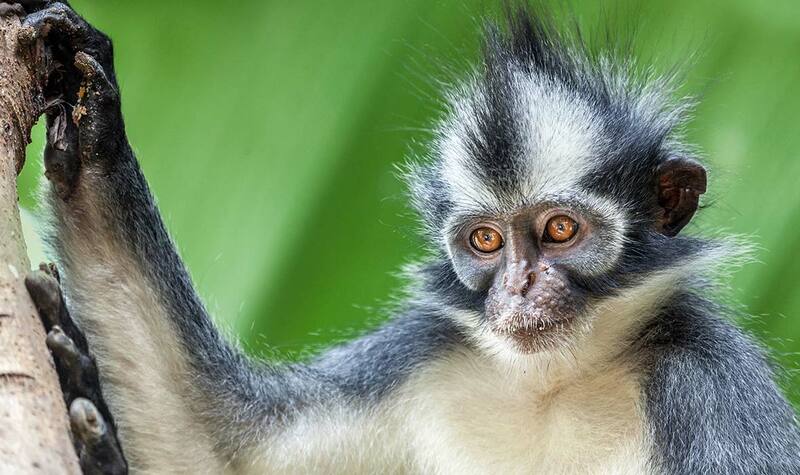 ABOVE: Thomas’s leaf monkey in Gunung Leuser. Unfortunately, the rainforest of Sumatra is experiencing the fastest rate of deforestation in the world. This destruction comes from a combination of destructive fires used to clear jungle for palm oil plantations, the plantations themselves, and human encroachment. All of this is carving up the rainforest, leaving the park’s animals stranded in islands of habitat, vulnerable to increasing conflict with humans. The original Bohorok Center suspended its orangutan rehabilitation program some years ago but continues to function as a tourist attraction where the majority of travelers to Bukit Lawang will eventually make their way to the twice daily feeding sessions. 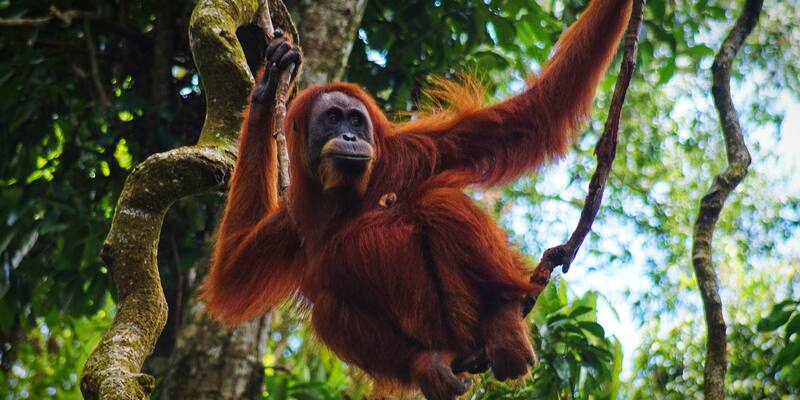 Today the Sumatran Orangutan Society has taken up the orangutan cause by raising money for their own efforts as well as related organizations. “Realistically, there are no easy answers, and conserving the Sumatran orangutan will continue to be complex work with no quick fixes,” says Lucy Radford of the SOS. Knowing the crisis is rooted in deforestation, the SOS’s projects include educating the public about what is happening in Sumatra. The Sumatran Orangutan Conservation Program, an affiliate of the SOS, is actively involved in rescuing endangered orangutans. The program rehabilitates apes rescued from dangerous situations as well as those in captivity and young ones confiscated from would-be traffickers. 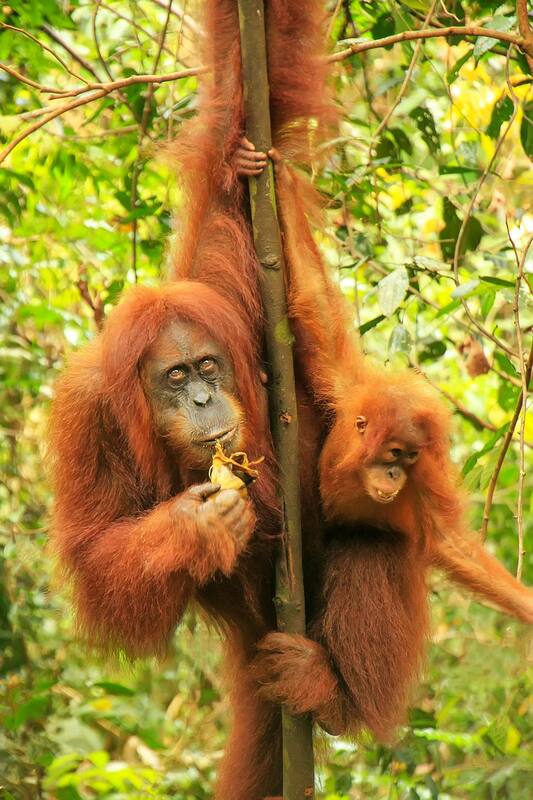 The orangutans are slowly re-habituated to safe areas of forest; for some this means being taught basic skills again, like foraging and making nests. The deforestation and resultant endangerment of the Leuser wildlife, with a special focus on orangutan conservation, was highlighted in the 2016 documentary After the Flood in which producer and host Leonardo DiCaprio visits the orangutan rescue center to learn about the plight of these rarest of the great apes. At over 3,000 meters, the air at the peak of Mount Leuser is cool and clear and the rainforest canopy stretches out like a vast, unbroken sea of green. To know that herds of elephants, solitary rhinos, and stalking tigers survive alongside the soulful, ginger haired apes of these lands is to believe that it must be preserved. John McMahon is a writer and habitual traveler who has made Kanchanaburi, Thailand his home base for fifteen years. Author of five novels, his fiction, essays, and reportage have been published all over the English speaking world. All fine things in life deserve time. 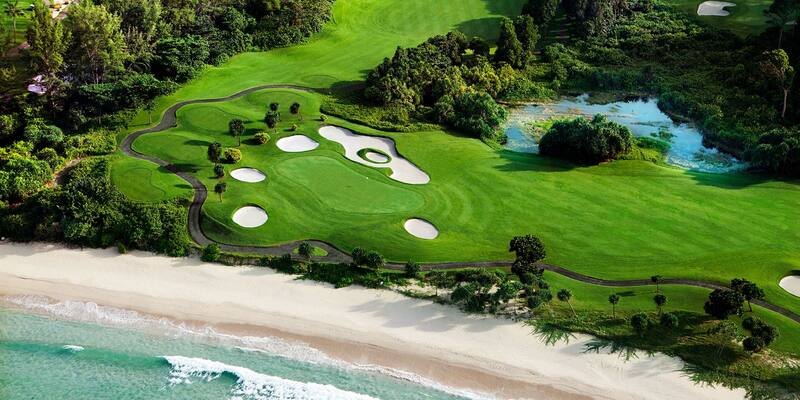 Indonesia is no exception, and after a whole month of this epic journey, you'll want even more. 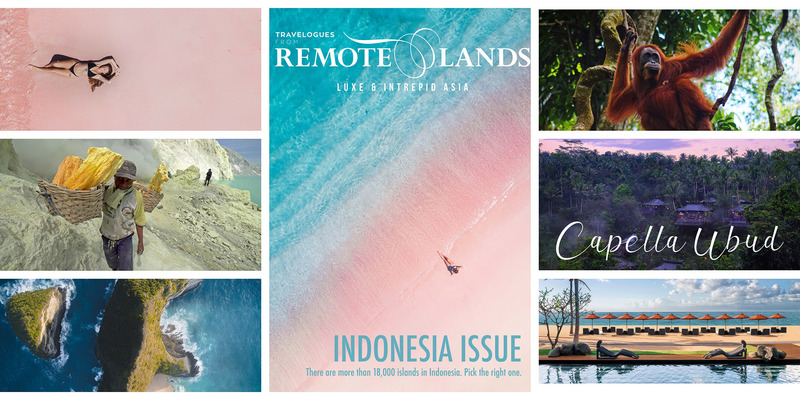 Fly, ride, drive and boat your way around, stopping off to say hi to the inquisitive orangutans of Borneo, hiking past the dragons of Komodo Island and navigating the majestic volcanoes of Java. Explore stunning and intriguing Sumatra, one of Indonesia’s most exotic islands, on this thrilling 14-day journey. 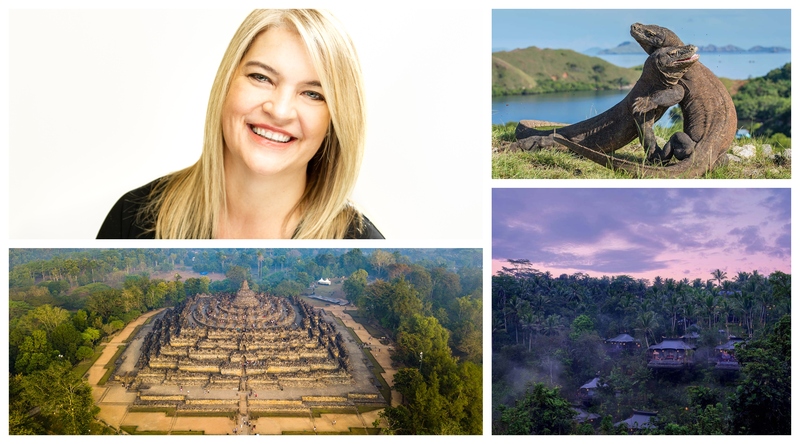 You’ll have the unique opportunity to spot rare wildlife, drive to remote villages deep in the jungle, observe ancient sites, hike Southeast Asia’s highest active volcano, and relax on picturesque beaches. 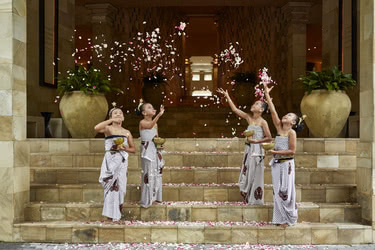 Travel 13 days in sheer luxury aboard your private jet to some of the most hidden corners of Indonesia. 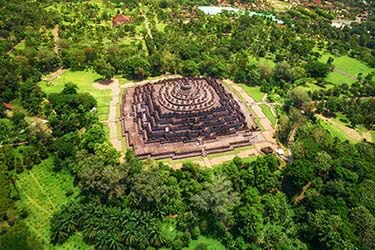 You’ll explore the ancient Borobudur in Yogyakarta, spot orangutans in Borneo, marvel at traditional burial grounds in Tana Toraja, enter the secret lairs of the Komodo dragon, and stay in luxury Indonesia hotels. 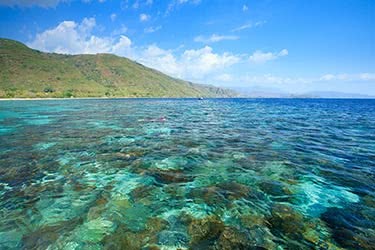 Spend 14 luxurious days languidly sailing the exquisite Indonesian archipelago from Maumere to Ambon. 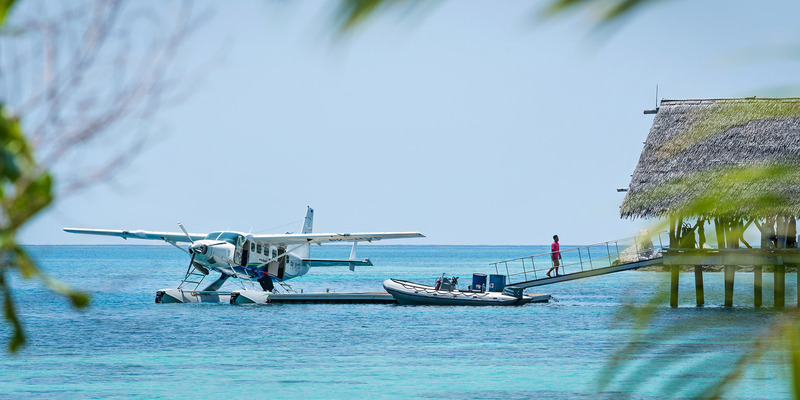 You’ll meet local tribespeople and learn about their daily lives, bathe in natural hotsprings, tour ancient forts, and hike through lush jungles, aboard your lush, air-conditioned, fully-equipped private schooner.